Products . . . . . . . . . . . . . . . . . . . . . . . . . . . . . . . . . . . . . . . . . . . . . . . . .
* Plug-in charger for (1-4) AAA or AA cells as well as (1-2) 9-V blocks. Capacity quick test, ultra-fast charging, -DeltaV charging. Individual supervision of each cell position / Faulty cell detection. Clear indicators and controls for each charge position. Switch mode power supply for worldwide use. 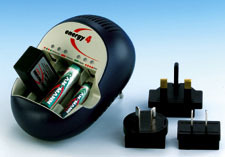 Iincludes primary plug set for Europe, UK, US and Australia. 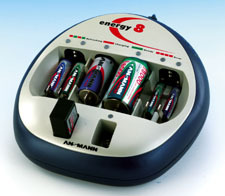 * Battery conditioning station with refreshing process for up to (8) rechargeable cells, (1-6) Micro AAA/Mignon AA, (1-4) Baby C/Mono D and (2) pcs 9-V blocks. Faulty cell detection. Trickle charge. Wide range input 100-240 V AC. 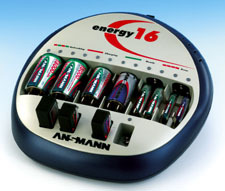 * Battery conditioning station with refreshing process for up to (16) rechargeable cells, (1126) Micro AAA/Mignon AA, (1-6) Baby C/Mono D and (4) pcs 9-V blocks. Faulty cell detection. Trickle charge. Wide range input 100-240 V AC.